Since the start of my degree, I have always known that I wanted to become a conservation biologist. In early 2014, I realised I needed to gain field-based experience in this area to complement my knowledge. That’s where Durrell came along. Being Jersey born, I had always hoped to work for Durrell in some form so imagine my surprise when I noticed the red-billed chough re-introduction student placement advertisement! It was a dream come true, an entry level project that would allow me to work with Durrell in the field and gain the necessary skills I would need for my later career. Fast forward five months and I have achieved everything I had hoped for, have made new friends (both chough and human) and have even been allowed to name one of the new choughs which is an honour in itself! Almost as soon as I had been accepted onto the project, I was thrown into the action. I first met Liz and the eight adult choughs (green, mauve, blue, black, red, cerise, yellow and white) on a sunny but windy Sunday afternoon and only two weeks later I helped with their first release of the season. Standing on the hill now aptly named Mount Dallas by the team in honour of the amount of hours I have spent there tracking choughs from it. I was amazed by the heights the eight birds rose to and the acrobatic displays that they seemed to be able to perform with such ease. Getting them to come back inside the aviary proved to be a problem and by the end of my first full day on the job, one bird had returned home while five were roosting in the nearby quarry and the other two (yellow and cerise) had travelled further afield. A search of the nearby area for these missing two gave us no clue of their whereabouts so Liz sent myself and Pierre (my fellow student) on countless searches across Jersey armed with our trusty radio receivers and maps taken straight from the phonebook (they are the only ones with all the road names!). 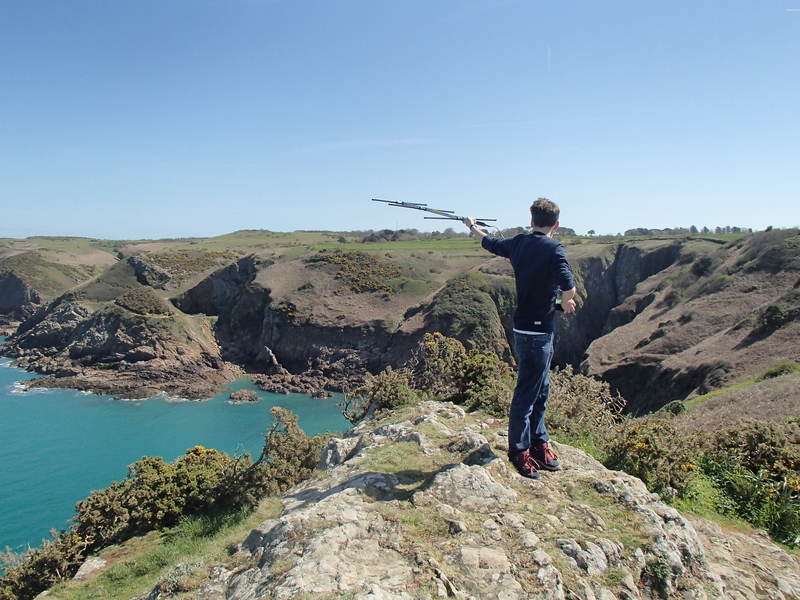 Over the next few weeks Pierre and I travelled the length and breadth of the island, both on foot and in my car searching every cliff path and exposed hill we could find, ever hopeful that if we somehow managed to find the missing birds we would be able to return to Durrell as heroes. Only once did we come close to finding the missing two choughs. It was an uneventful Friday and Liz and I had spent the whole day searching the west of the island with no luck. 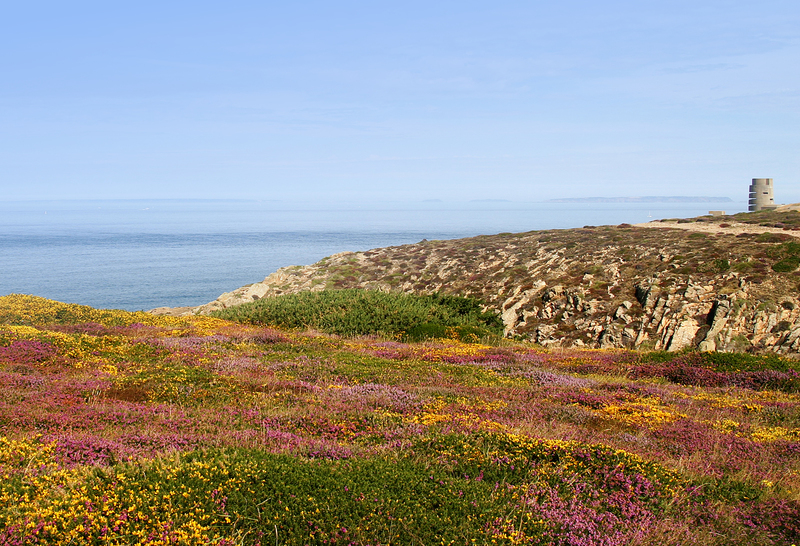 As dusk approached we decided to end our search at Noirmont Point, only to find that our radio receivers were picking up a signal for one of the birds (cerise). The signal itself was coming from one of the many bays in between Belcroute Bay and Noirmont. Unfortunately, the high tide and the presence of large areas of private land prevented us from searching further. Over the weekend we were able to get slightly closer but then the signal had disappeared never to be heard again. A frustrating end to what was such a hopeful chance. Soon a month had come and gone and the arrival of four chicks back at the Wildlife Park soon meant that Pierre, Harriet, Liz and I had more work on our hands! I was lucky enough to have been one of the first staff members to see one of the newly hatched chicks having coincidently arrived back from lunch at the perfect time! 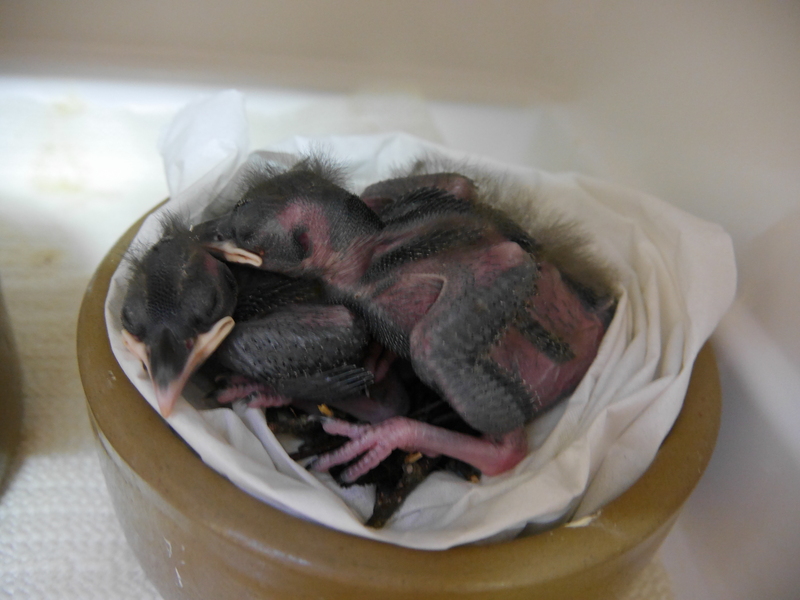 I was always extremely busy during this time as I would spend my mornings searching for the missing adults, my lunchtime helping staff feed the chicks and my afternoons helping to release the other six adults. As the chicks grew and our searches for the missing choughs grew more and more desperate, my day soon became re-organised. By early June we were spending most of our time back at Sorel “chick-proofing” the aviary by building countless roost boxes and by laying rat proof mesh under the floor. The chicks moved into to their new home at Sorel in mid-June, by this time the six adults had established themselves in the surrounding area and only relied on us for food. However, they did still spend a great deal of time at the aviary. This meant that a new stage of my placement could start. One of the main questions the team had at this time was how the adult choughs would react to the new presence of the chicks at the aviary. To test this, I helped Harriet to develop a series of observations that would allow us to watch both the adults and chicks from a nearby field and witness any interactions that may take place. We decided to try and do three one-hour long observations each day: one in the morning, one over lunch (when both the adults and chicks were fed) and one in the afternoon. These observations have continued over summer and the team are still performing them now. One of the great things about being around the birds for such long periods of time is that you begin to recognise and appreciate their individual personalities. I am still amazed by certain birds’ apparent greediness and it still makes me laugh when I see the chicks playing with pieces of wool. By July, the chicks had matured enough to begin their own series of releases and experience the outside world for the first time. 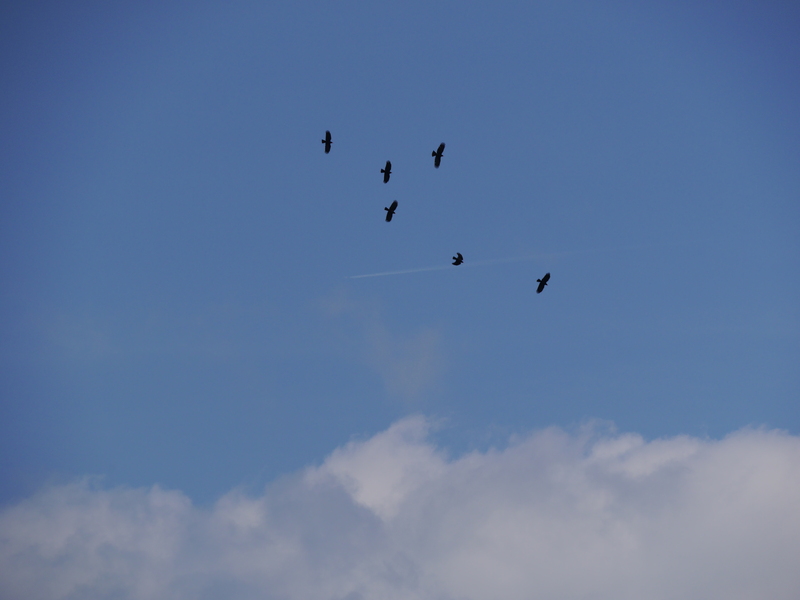 Although these birds were only let out a few times they took to the skies in a manner similar to the adults before them; flying high and testing how far they could test their limits. 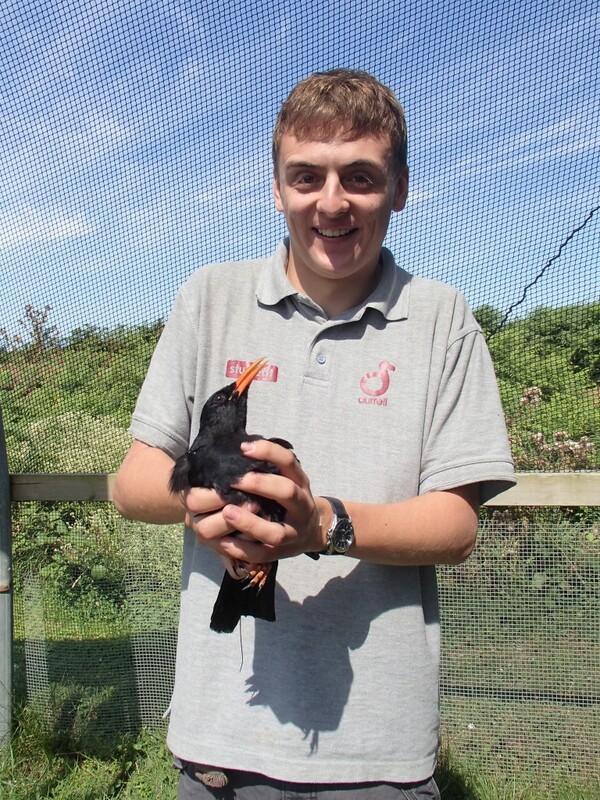 July also brought me a fresh and exciting challenge as Liz and Harriet had to collect six further chicks from Paradise Park in Cornwall, leaving me and the new student Max alone with the birds for the first time. I had spent the weeks prior to this learning how to feed and train the birds correctly but nevertheless I was still terrified when the dates rolled around. In the end, it was far less stressful then I had anticipated and with the help of everyone in the Bird and Conservation Departments I managed to go three days without harming a single chough! Looking back so much has changed since I first started this placement. I have learnt so much in my brief time with the choughs and I have really enjoyed every minute of my time with both the choughs and the team from Durrell. If anyone were to ask me if I would do this placement again I would not hesitate to agree and sign up again. 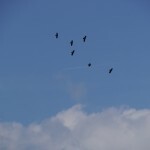 This entry was posted in Blog, Choughs by Glyn Young. Bookmark the permalink. Well done Adam, it’s great to get a feel of your enthusiasm for this project from your article. best wishes for your future career. It’s a great project and really nice report … am glad you found it rewarding. I wish you well for the future.